Some Adware applications deceive people by posing as useful extensions while others explicitly state their true intentions. However, regardless of this, we recommend that you remove iDeals, because it is just another adware-type program. Of course, it is not promoted as adware, no, it is promoted as a “shopping optimizer.” iDeals promotes products that are on sale on Bestbuy.com, Amazon.com and other online merchants, but we do not think that this application’s developers are directly in contact with these websites. In any case, if you do not want to see third-party content while you are shopping online then you ought to delete this unreliable application. In this article we will provide you with essential information about this program, which will prove to you that it is unreliable. So let us begin. iDeals Shopping Optimizer’s developers are based in Jerusalem, Israel. Not much else is known about this emerging developer, but we will surely keep an eye out for it further down the line. 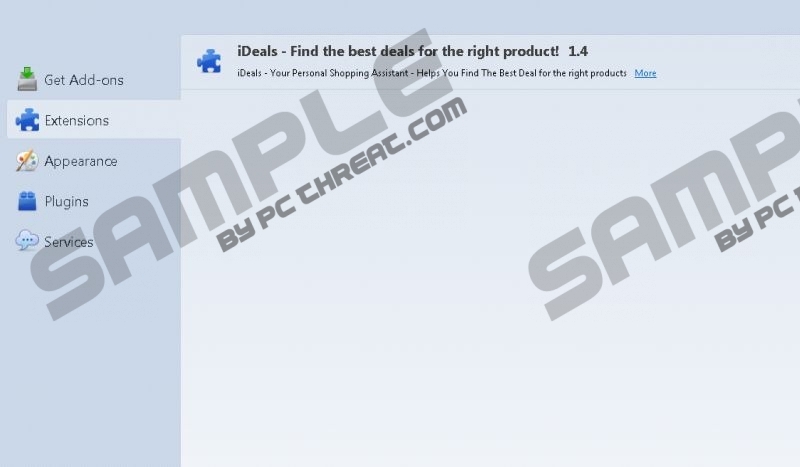 iDeals has its own promotional website at Getideals.com, which features a download link for Google Chrome on the Chrome Web Store. Nevertheless, this program is supported by Microsoft Internet Explorer and Mozilla Firefox. Internet Explorer and Firefox versions are known to be distributed using third-party bundles. This means that this application comes as a clandestine addition to various legitimate applications that users willingly download from freeware sharing websites. Therefore, we recommend to always opt for custom installation and opt out the installation of undesirable content, or just avoid visiting unscrupulous software distributors altogether and get your software from its original websites. iDeals is not an immediate threat to your computer’s security. However, it will not optimize your shopping experience even one bit. While you browse online shopping websites, such as Bestbuy.com you will be presented with coupons labeled “by Shopping Optimizer.” This application should compare prices of the same product on different online retailers. However, it shows irrelevant products that are not in any way related to the product you may be viewing. Furthermore, if you click iDeals’s ads you will be redirected not Amazon or Target, but to unrelated websites, such as Bizzmag.com and Forbes.com, so as a shopping companion this application is utterly useless. We hope that the information we have provided was insightful. As an online shopping optimizer iDeals is absolutely useless. It redirects to unrelated websites, because its advertisements are misleading. iDeals is set to collect information about you which is not very sensitive, but untrustworthy entities can make money from it by selling it to other third-parties. if you disapprove of these activities, then you should remove this application. Type Control Panel in the search bar found on the Taskbar. Locate iDeals and double-click on it. Click Search, type Uninstall a program and click on it in the search results. Locate iDeals and click the Uninstall button. Locate the application and click Uninstall. Click Start and open the Control Panel. Locate iDeals and click Remove. Quick & tested solution for iDeals removal.